Note : English is not my native language, grammar correction would be appreciated. News : Guide started on 13 May, Finished on 16 May, Complete on 20 May. Adding new section about resources (B.5.b.) and Coupons (B.5.c.) on 24 May. Removed on 25 May, Revived with some removed content on 04 June. - FAQ about ship refer section A.3.f.1. I can't stand the wall of text, what should i do ? Never skip the tutorial, now you must suffer If you are new, you need to know the game display (basic). Read Quick reference In the end of this guide. Beginner section explain things "deeply"
Time world is a Sci-Fi MMORPG with fully costumizable units, story campaigns, stunning graphics, and additive gameplay. 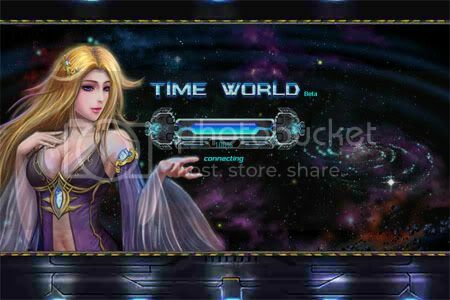 Time world developer is Playmage (server at http://www.perfectgalaxy.com). 1.a. There is 4 race, they have an unique technology war device that can be upgrading beyond lv 25. 1.b. Are they equal ? admin wrote: You can't directly compare the stat difference amounts as the math is not that simple. The attack bonus difference looks big compare to accuracy, but since attack potential is actually (100 + attack bonus) * accuracy, biochem weapons actually has the lowest attack potential, though it has higher lethality to compensate for it. For example, let's look at level 25 comparisons. Biochem at level 25: 225% attack bonus, 80% accuracy. While it looks like 30% extra attack bonus is bigger than 15% accuracy bonus, it's not true. Let's take simple average of 100 hits. This is because the final attack power of biochem is not really 30% stronger the missile, it's only about 15% stronger (2.25 vs 1.95), and missile actually hits 19% more often than biochem (95 vs 80). Note : This is doesn't including heroes skill e.g. hit skill. Army points : How much ships that you can assign on your best 5 command/ war heroes. Each ship class have its own point (refer to the shipyard section). ( your best 5 command/ war heroes) and army points. Ranking : Your power ranking in Time World. Account name and Game progress (%). Amount of your Credits, Ore, Energy, Action Point (regenerate every 15 mins.) and gold. Red circle indicates that you're currently using special item (VIP card, talent card for double exp). Special item stacked. (e.g. VIP S + M = 37 days). Collect button (red circle) = Collects resources from all buildings. 2.a. Hero button = Setting your hero attribute points, equipment. Inventory. h1 has 2 buttons : to sort hero names by command or by grades. h2 : click their name to show the hero page. Hero slots and inventory need gold to expand. You can expand a hero slots by adding 10 Time world friends on the Facebook (up to 3 slots). h3 has 2 tabs : Skill slots (click the skill to upgrade or deleting it, refer to skill section A.5.) or equipment slots. b3 green square : Attribute description (click to reset, gold cost depends on hero level). There are 4 attributes : Command (let you assign more ships on this hero), War (attack and 50% defend point), Build and tech. c1 Works like army button (assign your ships). Note : you can just decreasing your ships through this button. 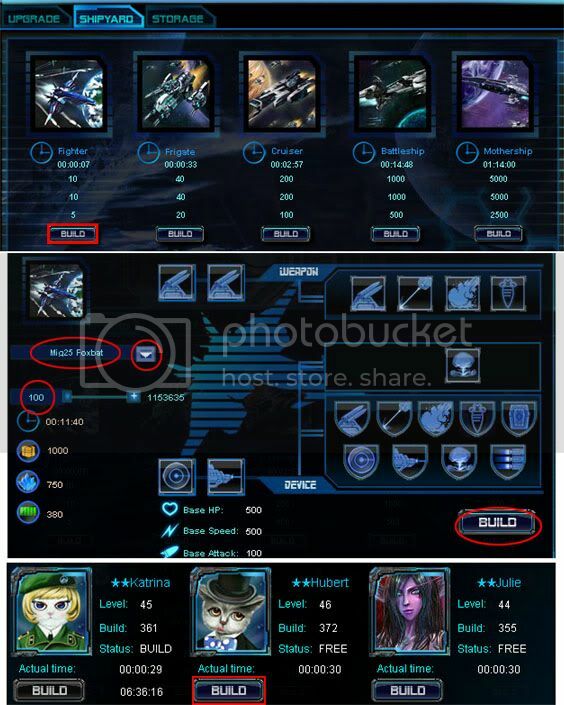 c2 Auto assign will replace your ships to hero's max amount after the battle. Click to activate it. Galaxy system to go to your guild page, Solar system button to visit your planets. Last edited by Zhao on Wed Aug 22, 2012 5:22 am, edited 50 times in total. Note : All buildings only affected the planet it belongs to, except shipyard storage and lab technology. 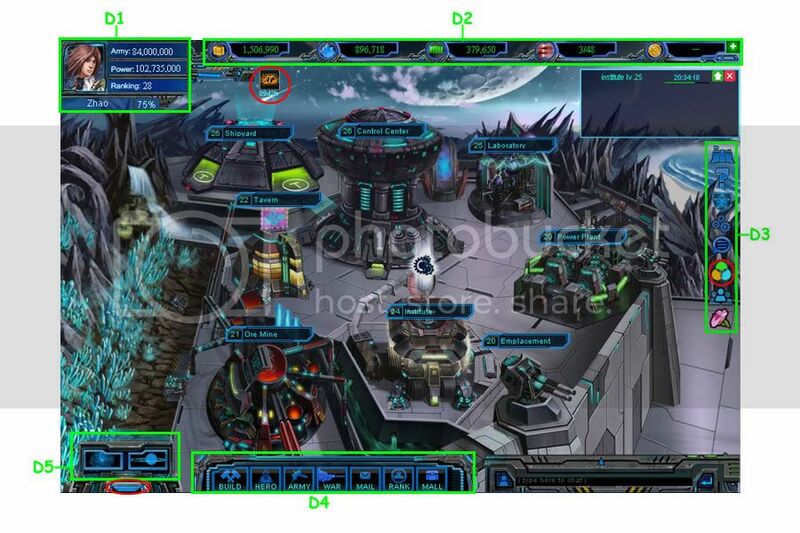 Credits is required to buy an equipment on the mall, upgrading buildings and technology, producing ships. You can not upgrading another buildings beyond CC level. Tabs : Upgrade and Task. Task tab shows you what is being built or researched. A.3.b. Ore Mine producing ore. Ore is required to upgrading buildings and technology, producing ships, donate base building or pillar health point. A.3.c. Power Plant producing energy. Energy is required to upgrading buildings and technology, producing ships and PvP. Upgrading your war device technology. It also reducing ore amount required to build ships on the same planet by 1% each level. Note : Lethality increases chance to completely destroying enemy's ship (can't be repaired). Lethality does not help to win a battle. Hint : you gained 50% resources from enemy ships that are destroyed when you're getting attacked. Upgrading civil and spy technology. It also reducing energy amount required to build ships on the same planet by 1% each level. Each shipyard level increasing your ship storage by 4 Millions and reducing time needed to produce a ship by 1%. -	There is click button, click it, you will find 3 tabs. Shipyard > Shipyard (tab) > choose ship type > build > input ship name (or click a down arrow button on the right). Choose devices, input the amount of ships. Click build then choose your hero to do the job. How do I completely delete old ship design? and choose "delete" after choosing the design to delete. Place where you can get a new hero. ** All players will start with a downward counter of 900 for blue (rare) and 9000 for purple (epic) heroes. ** Each refresh multiplier that doesn't generate blue/purple hero will be deducted from the counter respectively. ** Players can still have chance be "lucky" and get a hero before the counter reach 0, in this case the respective counter is reset to 900/9000. ** To compensate for the new guarantee, lucky blue and purple odds have been slightly lowered to 1:900 and 1:9000 respectively. ** Using a level 3 hero card will not change your blue counter, using level 4 hero card will not affect either counter. You can go into Tavern’s Trade Center to trade Ore, Credits, and Energy. attacking someone (his emplacement attacking you). Last edited by Zhao on Sun Jun 03, 2012 11:54 pm, edited 25 times in total. There are 4 type of the hero (refer to their name color). You may use up to 5 battle heroes. It is based off the highest stat. War highest and Command is secondary. Command highest and War is secondary. Build highest and Tech is secondary. Tech highest and Build is secondary. 4.2. Add 10 friends on Facebook to open a hero slot (up to 30 friends, 3 slots), then you need gold, 9th slot cost 30 gold and +5 for each slot, up to 20 slots. You can buy skill book on the mall for 12 gold (or 12,000 coupons). Use upgrade book to upgrading it for 8 gold. You have small chance getting skill book through visit and daily spin. To use it, go to your inventory, click it, use, then it will transform into bumble bee, apply to your purple hero. Speed, hit, tech skills are common, multiple, triple and avoid are hardest to get. 1. Multiple lv 1 (700 gold in auction) 12% chance to attack 2 targets, lv 4 14% chance to attack 3 targets, lv 7 16% chance to attack 4 targets. 2. Triple lv 1 (700 gold in auction) 10% chance (+2% each level) to attack 3 times. 3. Combo lv 1 (200 gold in auction) 10% chance (+3% each level) to attack 2 times. 4. Critical lv 1 (300 gold in auction) 10% chance to attack with 150% damage (+2% chance and +10% damage each level). 6. Dodge lv 4 (300 gold in auction) 12% chance (+2% each level) to dodge attack. 10. talented lv 1(200 gold in auction) 2% (+2% each level) increases heroes exp gained. You need ships to fight, ship are classified into six class. To unlock ship class, you need to upgrading your shipyard level. Hero’s command determine how much ships that you can assign to that hero (e.g. 1 com = 100 fighter). 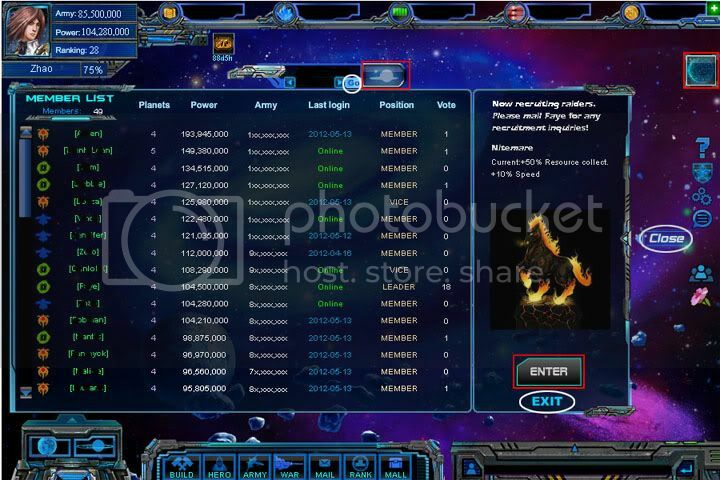 Each ship will add your army points and count as a part of your total power. Each ship class has different device slots, e.g. fighter has 2 slots, it attacking 2 times. Mother ship has 4 slots, it attacking 4 times. B.1. What is my level ? There is no such level as in RPG game. People usually refer to the chapter that you're doing now. When the server refresh (daily bonus) ? You want War is higher when you re doing PvP (see advanced section). Enemies in mission didn't have war attributes, so use higher command to increased your ships. Army strength is based number of ships and ship class assigned to officers. Factors that help player win including army strength, the weapons and devices carried on each ship and the hero's attribute and skills. All ships take turns to fire there weapon slots during each battle. 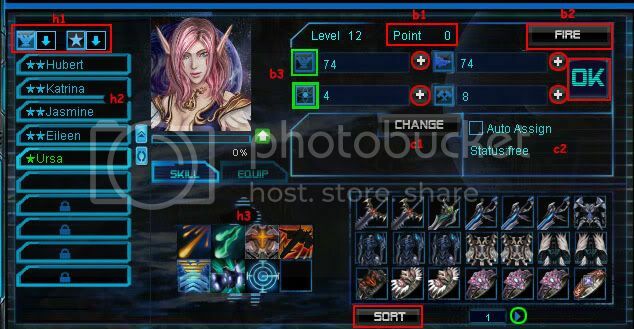 The ship equipping the highest speed device will fire first, and hero's leadership skill breaks ties. Battle ends when all weapon slots are fired or if the ships on one side have all been defeated. When firing weapons, each fleet will have 70% chance of attacking opponent's fleet with highest total power (army strength), with 30% chance of attacking a random target. The side suffers the lower percentage of total HP damage wins at the end of combat. When you're attacking someone, you fight against their fleets and Emplacement, choose their planet wisely (the one is likely to have lowest emplacement level, it's usually the last planet on low level player and 1st planet on high level player). Each player can only be attack by the same player 3 times per day, and can only be attacked by players whose Total Power is between 85%-120% of theirs (indicates by yellow color name). Note : People often says that this is online strategy game, PvP based, if you hope you can play peacefully, try Farmville. A. Democratic : Mailed someone that attacking you frequently, ask him to attacking you only 1 time per day (or not attacking you at all). You can't force him to do it. Another way is to add him/her on Facebook. B. Conservative : Ask your friends / guild members to "punish him". Upgrade your lab and war tech, Buy peace card. C. Communist : Upload your ship with Biochem+Lethality, your enemies will think twice before attacking you again. After reaching chapter 6, galaxy members can create or join raid teams to fight raid bosses. You or your galaxy members need to collect gem fragment and assemble boss gems to create a raid team (refer section 2.D.3.). Coupons are rewarded for fighting the bosses which can be redeems for goods in the mall. AP generate each 15 minutes, that's mean in 1 day, you can get up to 96 AP. Note : You get reduced amount of exp by 86% from repeating cleared mission. Tips : You can see the exp that you gained in hero tab on the battle report. #Thanks to Bramble Thorn for the explanation. x2 hero exp + x2 hero exp = x4 hero exp gained. x1.5 resources + x1.5 resources = x3.0 resources gained. x1 hero exp + x1 hero exp + x1 hero exp = x3 hero exp gained. x1.0 resources + x1.0 resources + x1.0 resources = x3.0 resources gained. x1.5 resources + x1.5 resources + x1.5 resources = x4.5 resources gained. x2.0 resources + x2.0 resources + x2.0 resources = x6.0 resources gained. PvP (another galaxy or Phantom Nebula) best! Destroyed ship gives your resources back, the amount is equal to the amount that needed to rebuilt those ships in planet with highest level of lab and institute. Note : This is mean that you actually didn't get the resources from doing WAR (mission) and RAID, you also lose some resources if you building ships in the planet that have lower level lab and institute. In Gem raid, you need to hit the boss at least once to getting the coupons, if its destroyed before you hit it, you get no coupon (same rule apply to the gem owner). The firing order is the fastest ships in the team hit first. Act like a guild. Another galaxy members is your friend. Donate ore to upgrading Galaxy's base building. 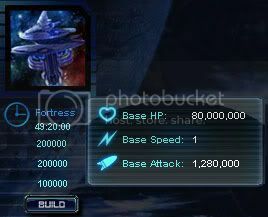 Once your galaxy reached base building level 3, your galaxy can fight for one of the 7 Unique Pillar buildings. Players are automatically assigned a galaxy when you reach chapter 2. However you can join another galaxy (mailed the galaxy leader for the password if it's locked, spam is not recommended) or create your own by research the appropriate civil tech in the Institute. There are several diplomatic relationships that can be between each galaxy based on the outbound diplomacy action set by the galaxy officers. To see your current galaxy diplomacy : Galaxy setting (see picture above, red square) > diplomacy tab. War(Hostile+ Hostile):100% more resource won/lost. Alliance(Friendly+ Friendly):Members unable to attack. Note : If your galaxy (Galaxy a) set Galaxy b to hostile, but galaxy b set your galaxy to friendly. It will be neutral on the display. But you still gained +50% resources from galaxy b as if it's hostile. a great galaxy have some strong members and active, inactive(s) will lead a galaxy towards destruction. Note : Attacking Zhao is very dangerous (lead into Browser error, very laggy, computer crash, data error, etc). 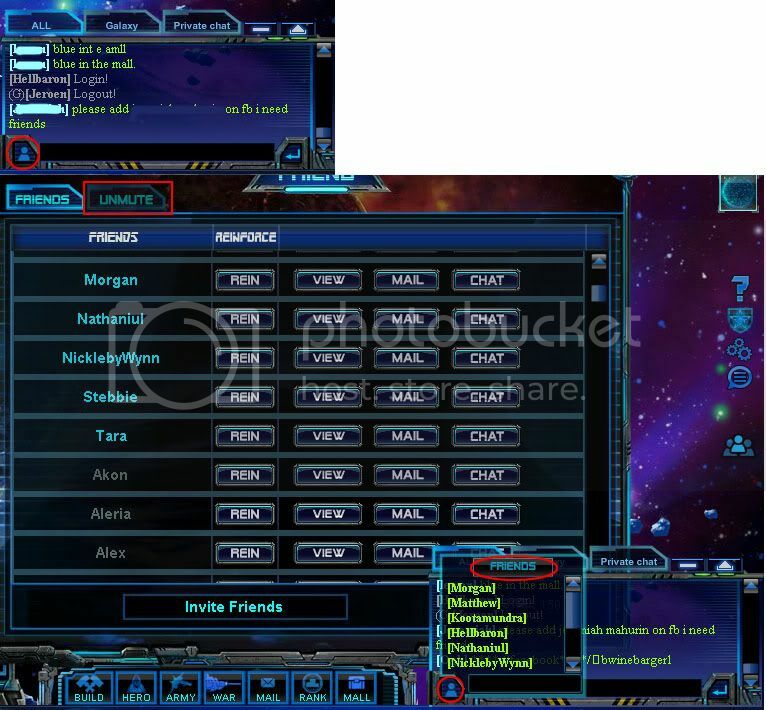 unmute : Click (people) icon on the bottom left of your chat, click friends button on the top, unmute tab. note : to close the pop up, click the people button again. Note : Blue name indicate online player. Last edited by Zhao on Thu Jul 26, 2012 12:33 am, edited 62 times in total. So with 200 points given, you can reach the optimum result which is 100,000 total attack. conclusion : balance distribution gives you the optimum result. Will i be the "strongest" with balanced distribution ? With the points given, you've reach the optimum result. People tends to put more war, though they have same amount of commands points as you, their war points may be higher. Note : PvP seems more important than pillar raid (dignity, badge, source of resources and experience). 3. Hero’s war stats also add defense in PvP battles, each war stat will cancel out 0.5 of opponent hero’s war stat. Last edited by Zhao on Wed Jun 20, 2012 10:16 am, edited 18 times in total. Point of correction. The secondary stat is NOT the second highest stat, it is based off the highest stat. I have a Hero who wears all War/Tech items. War was highest stat and Tech was second highest stat for a while. Command gained two points on level up. Tech gained none. Phantom Galaxy is Marginally better in gaining Hero Exp, and equal or WORSE in gaining resources. You might also want to note that the Mobile Fortress (level 6 ship) has primacy in the fleet targeting algorithm, and will always be targeted 70% of the time whenever present, even if another fleet is more powerful. Nice work on the guide, by the way!